Released on Aug 3, 2018. Released on Aug 1, 2018. Previous dicpath in Komoran’s API is now modelpath . The name was changed to prevent confusion with the newly added userdic . Released on Oct 25, 2015. Released on Feb 27, 2015. Released on Feb 25, 2015. Released on Jan 18, 2015. Released on Sep 7, 2014. Released on Sep 4, 2014. Released on Aug 25, 2014. The versions below do not have documents available, and are not backwards-compatible. Released on Aug 1, 2014. Released on Jun 15, 2014. 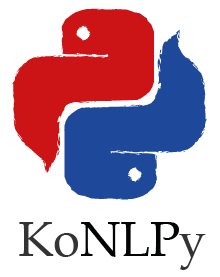 Initial release of KoNLPy. Inspired by Heewon Jeon’s KoNLP project, a wrapper of the Hannanum analyzer for R. The name KoNLPy, comes from this project.